. . . no small feet: reservation booked, or was it? reservation booked, or was it? One of the little annoyances (oh, yes there are many . . . do you know that Irish dancers wear wigs, tan their legs, wear dresses more expensive than an average mother's wedding dress?) about having a kid compete in a big Irish dancing competition, is securing an approved hotel room. The group that runs the event requires the participants to lodge in one of the hotels where they have set aside a block of rooms. In order to verify that these families aren't 'cheating' and making reservations at non-room-blocked hotels, the organizers require each family to fill out a form and submit it to the committee in advance of the competition. I held the phone in my hand back on February 1st, poised and ready to punch in the phone number for the Hilton in New Orleans at precisely the time that the block of rooms was scheduled to open. New Orleans was hosting this year's National Irish Dancing competition. I had the list of available hotel room blocks open on my computer, but I hoped to land a reservation at the Hilton Riverside. The actual dancing competition was taking place on the Hilton's first floor. Sleeping in the same hotel as the competition alleviates the added headache of figuring out transportation to the competition. Since I often have non-dancers with me, it is convenient for the non-participants to be able to relax in the hotel room, or hang at the hotel pool if (WHEN) they get bored with the competition. I remember that phone call to Hilton vividly. My kids were at school, but I was sitting for Theodore and Gilbert. The boys were playing in the basement. I ran up to the study and watched the clock in order to call right at 10 am when the block of rooms opened. I was thrilled that the phone line wasn't busy, and I got my two queen beds preference on the first try. Yippee! Theodore emerged from the basement while I was sharing my information with the Hilton employee. Thanks to his wound-tight personality, Theo NEEDED to tell me that he pushed his little brother down while they were in the basement. He admitted that it wasn't an accident. He didn't want his baby brother Gilbert on the chair where he stood to reach the air hockey table, so he pushed him down. I ran down to the basement. Gilbert was fine. I ran back upstairs and motioned for Theo to sit in a timeout. Meanwhile, I spelled my name slowly into the phone for the 3rd consecutive time. Theodore's loud sobs made it difficult to hear the Hilton rep. I moved his timeout spot to the mudroom. I jotted down my confirmation number and released Theodore from his time out. Months later it was time to fill out the hotel form to submit to the dancing committee. 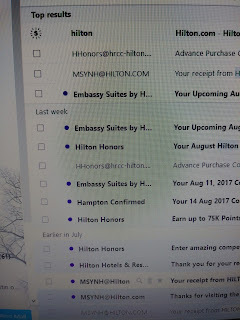 I decided it was easiest to do a search of Hilton emails for my confirmation number as opposed to paging back to February in my handy-dandy, paper (not-digital) notebook where I jot down everything. 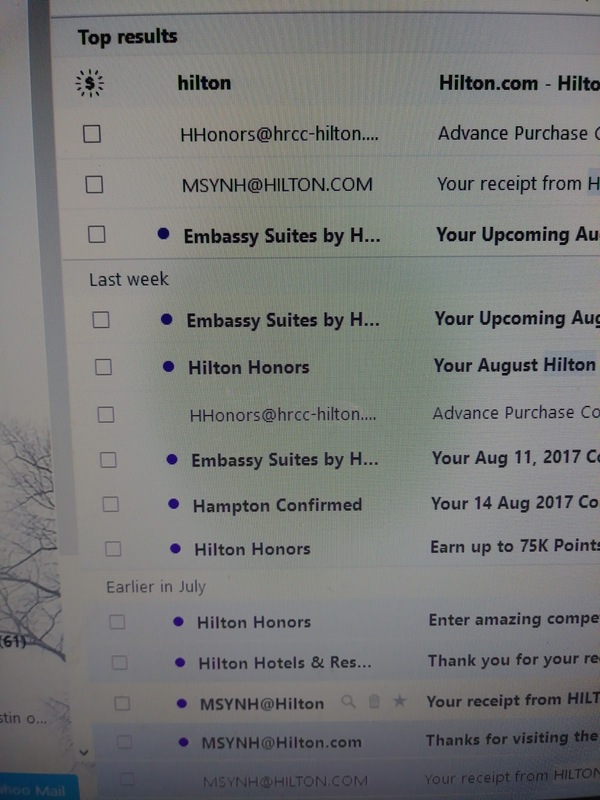 That's when I realized that in an effort to delete the thousands of unwanted emails I accumulate over time, I had inadvertently deleted ALL off my Hilton emails. Oops. I've fallen into my old habits of allowing stupid Hilton emails to collect in my overflowing in box. I called the Hilton Riverside directly. I almost dropped the phone when they said they had no reservation for me. I sent Curly to play in another room to shield her from the anticipated language that I felt about to erupt as I broke into a sweat. How could I secure a room at this late date? My heart pumped as if I had just danced a heavy jig for two hours around my family room. I'm not shy . . .